The play takes place over a period of two years. An old victrola plays a scratchy song. A woman laughs. This song brings back pleasant memories for her, and she starts to hum along. Suddenly, the record slows. The sound distorts. We think something’s happened to the victrola! No. Something’s happened to the woman who is listening. Her name is Emily Stilson, but right now it might as well be Alice, and Alice has just fallen through the hole. She does not know. What she sees and hears make no sense to her. Stranger still, she can’t remember who she is. She thinks perhaps she’s dreaming. She wonders if she’s dead. Wings is the story of Emily Stilson’s terrible and wondrous journey. The journey of the play itself is almost as remarkable. In the fall of 1976, National Public Radio commissioned me to write an original radio play. They did not stipulate what the play should be about. I decided to write about something that had been on my mind almost constantly since the past spring. That was when my father suffered a major stroke, rendering him incapable of speech. Because of complications related to his aphasia, and typical of stroke, it was impossible to know how much he comprehended. As best I could, I had been trying to understand what he was going through. It seemed to me that, regardless of how reduced his senses were, the isolation he was being forced to endure had to verge on the intolerable. Yet, not only did he tolerate this state; every now and then, if one watched carefully enough, something escaped from this shell that was his body and his prison which I felt possessed a kind of glow, rather like a lamp way off in the dark, something only barely perceptible. I took these faint flashes to be him, signaling. And although I allowed for the possibility that what I was perceiving was nothing but the mirrored reflections of my own hopeful and constant signalings to him, nonetheless, it seemed to me – indeed, seemed irrefutable – that in some essential way, reduced as he was, he was still the same person he had been. This thought was both heartening and frightful. To what extent was he still intact? To what extent was he aware of what had befallen him? What was it like to be inside? So, I thought, if I write about this terrible condition, maybe, through understanding, it will help ease my pain. I knew of course that I could not write about him directly. Not only was I was too close to him for any objectivity, but his case was too severe, and grim, and grimness, I had now begun to see, was not really what this was all about. So I looked elsewhere for a model. And realized I already had one: an elderly woman. I had met her that past summer while accompanying my father one day on his rounds. When he went down for speech therapy, she was one of the three other patients in the room, though, at first, her eyes were so strikingly alert I thought she was a visitor like me. I could not have invented her if I’d tried. To get the session started, the therapist asked this woman if she could name the seasons of the year. With much effort, she did, though not in proper order. The therapist then asked her which of these seasons corresponded to the present. The woman turned to the window. It was open. She could see a garden, and flowers. She smiled. It was clear to all that she knew exactly what the season was. Any fool would! So she tried another trick; she cocked her head and listened to all the birds. When this too led to nothing, she sniffed the air. When nothing came of this, she turned to what she was wearing, a light cotton dress; she even touched the fabric. Something connected. Her lips began to form a word. She shut her eyes and waited. The word emerged. Winter. When informed it was summer she seemed astonished, how was it possible? Obviously she knew what season it was, anyone with eyes could tell what season it was! And yet . . . I sat there, stunned. I could not believe that anyone making a mistake of such gross proportions and with such catastrophic implications could laugh at it all. A nurse brought me to her room (she was out, gone down to dinner) and showed me a photograph pinned up on her wall; it had been taken when she was in her twenties. In the photograph, a biplane sits on a grassy field. The plane is a Curtiss Jenny. A pilot sits in the rear most of its two open cockpits; she is standing out on its lower wing, white silk scarf around her neck, goggles set back on top of her leather helmet. Her face is lean and handsome and imperious. The same noble and slightly quizzical smile I’d seen that afternoon is there. Her right hand is holding on to the wire stays behind her. Her eyes are filled with an unquenchable eager passion. Her left hand is waving toward the camera and the unseen throng. This woman, whom I never met again, became Emily Stilson. Wings is what it is because of her. A year after I wrote the radio play, I adapted it for the stage. In the winter of 1978, Jeffrey Lunden and Arthur Perlman saw this stage version, with Constance Cummings as Emily, at the Kennedy Center, in Washington, D.C., where it was playing just prior to moving to Broadway. Clearly the play sparked something in them that mattered deeply, for eleven years later they got in touch with me and asked if they could set my play to music. I thought it was an odd request. A play about stroke – set to music? But then again, it was certainly no odder than the way this play itself had come to be. What you have here is the result; to my mind – and I am not alone in this – a soaringly remarkable result. Fully worthy of that handsome elderly woman who dared to walk on wings. Based on the eponymous play by Arthur Kopit, Wings details the extraordinary adventure of an elderly woman, an ex-aviatrix and wing-walker in the 1920s, who is the victim of a stroke but who retains her lucidity. 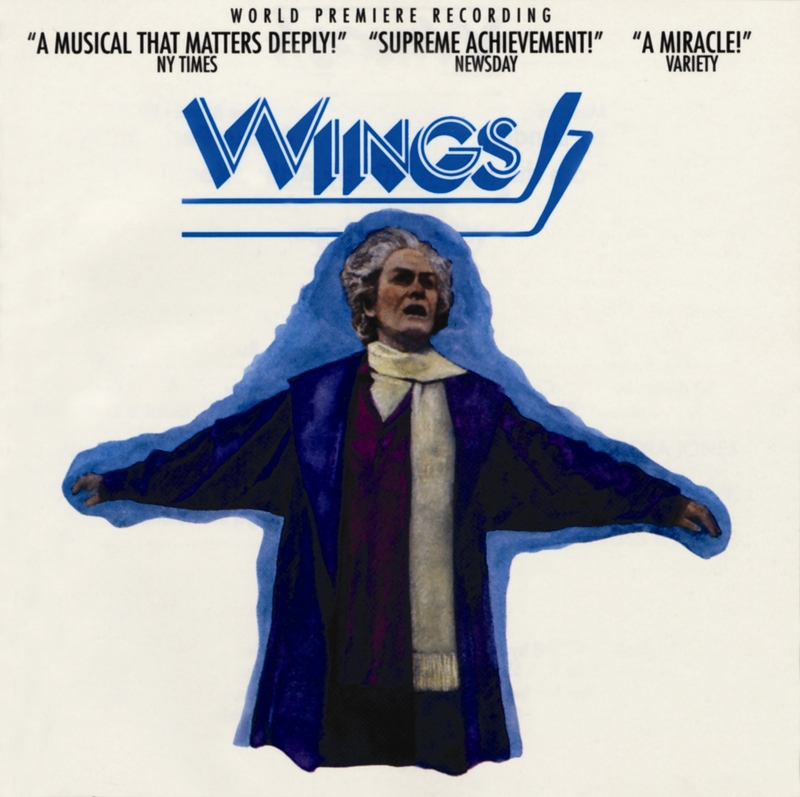 Far from being a “play about a stroke set to music,” Wings proves to be a compelling musical journey, with its most captivating moments sensitively expressed in the songs written by Jeffrey Lunden (music) and Arthur Perlman (book and lyrics). Originally produced by the Goodman Theatre in Chicago, Illinois, in October 1992, and directed by Michael Maggio, it debuted at The New York Shakespeare Festival Joseph Papp Public Theater on February 23, 1993, with Linda Stephens, Hollis Resnik and William Brown in the cast. It closed on April 18, after having played 16 previews and 47 performances.